February 2, 2019 11:30 pm. The Thoroughbreds take centre stage at the Abu Dhabi Equestrian Club on Sunday when the maximum field allowed of 14 will take their chance in the concluding 1600m handicap. A leading contender is Treasured Times, winner of his only previous visit to the capital and who has sneaked in at the bottom of the weights. Trained by Rashed Bouresly and the mount of Jesus Rosales, the 5-year-old entire son Teofilo will be having just his fifth career start and first since last February. Impressive when winning a 1600m Abu Dhabi maiden last January on his second racecourse appearance, he looks a big danger to all. Now a 12-year-old Royal Revival, trained by Satish Seemar whose team have been in good form all season, returns to the scene of all three UAE victories he has achieved, once over this 1600m, twice at 1400m. His most recent victory was in March and he is to be ridden by Tadhg O’Shea with Richard Mullen opting to partner local debutant, Gaudi. Formerly trained by John Gosden, the 4-year-old Invincible Spirit colt won once in what was his fourth and most recent start on the all-weather at Lingfield in October. He will be making his turf debut. Ahmad bin Harmash, another trainer whose runners have been performing well throughout the campaign, saddles both Archer’s Arrow, the mount of Harry Bentley, and Strong Challenge, the choice of Connor Beasley. Six weeks ago, over this 1600m course and distance, Beasley and Strong Challenge were staying on strongly when third and clearly relishing the return to turf after a pair of lacklustre runs on dirt at Meydan and Al Ain earlier in the campaign. A 6-year-old gelding by Exceed And Excel, he could hardly be described as a prolific winner having scored just once, on his second start for Godolphin as a juvenile in June 2015, but he was then considered good enough to contest the Group 2 Vintage Stakes at Glorious Goodwood, the same course he won his maiden over 1200m. For Doug Watson and Mohd Khalifa Al Basti, Mightily has to be considered returning to turf having made all four local starts on the dirt surface at Meydan. A 5-year-old Dubawi gelding, he recorded his sole victory on heavy ground in France, over 1800m, in November 2017 for Godolphin and looked an exciting new recruit when, on his local and dirt debut, he was third over 1600m at Meydan at the beginning of November, but has seemingly not progressed. The Erwan Charpy string are hitting form and he saddles Juthoor for His Sheikh Hamdan bin Rashid Al Maktoum who will be having just his second start for the Frenchman, having failed to beat a rival, over 1600m on the Meydan dirt, two weeks ago. That was only his sixth career outing having arrived in the UAE with one win, in a 1400m novice stakes at Thirsk last August, to his credit for William Haggas. A 4-year-old Shamardal gelding, the change of surface looks in his favour and he could well prove an exciting new recruit for his new trainer who, earlier on the card, saddles the same owner’s Jabal Aly in a 1600m handicap, the best of the five Purebred Arabian races. Always held in high regard by his trainer, the now 9-year-old made a winning local debut in January 2016, over 1600m at Al Ain, but has failed to add to that in six subsequent outings. 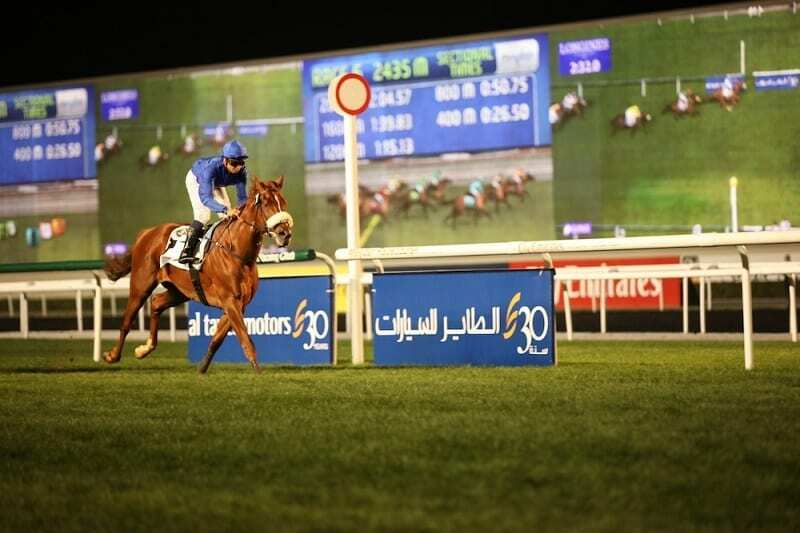 Trained at Al Ain by Jean de Roualle for Yas Horse Racing Management, Qader is seeking a fifth career win and third consecutive one, having landed a handicap over this course and distance in February and, again under these conditions, making a successful return in December. Khalid Khalifa Al Nabooda, Ernst Oertel and Tadhg O’Shea combined for an Abu Dhabi treble last Sunday and team up here with AF Maher, second, then third on his two most recent outings, both over this 1600m, having made a victorious seasonal return over 1700m at Sharjah.